Blowout Sale! 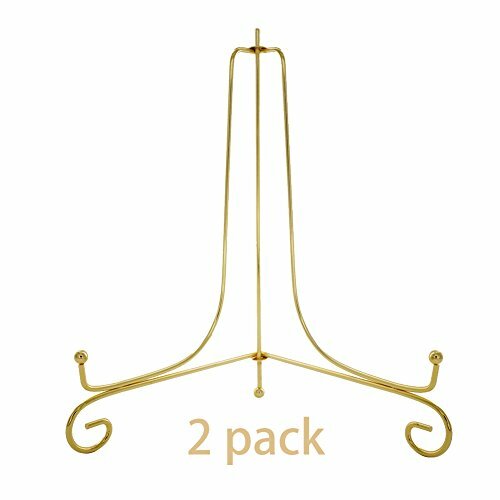 Save 53% on the (2 pack) 10'' Iron Large Plate Stand, Gold Iron Easel Plate Display Photo Holder Stand, Displays Picture Frames, Cookbooks, Decorative Plates, Tablets and Art by Artliving at Home Decor Outlet Store. MPN: AR1000J-10-2. Hurry! Limited time offer. Offer valid only while supplies last. Curved metal stand to display photos, books,artwork, collector plates & more! It is made of sturdy iron which is durable and last for long time. The picture easel stand is adjustable, and the width can be adjusted by adjusting the folding hinges. And it can fold flat for easy keeping when it is not in use. It is table top easel, so it is easy to place on the table or desk. The item comes with 18-month warranty. If you need any help, please feel free to contact us via email and we will give the response to you within 24 hours. View More In Display Stands. If you have any questions about this product by Artliving, contact us by completing and submitting the form below. If you are looking for a specif part number, please include it with your message.